As the crispness of a San Francisco winter slowly begins to fade, the first signs of spring appear the the farmers market. My favorite farmers market in the SF Bay Area thus far is the one at the San Rafael Civic Center – many of the same vendors as the Ferry Plaza Farmers Market minus the tourists. The weather in San Rafael is also generally warmer and more conducive to walking around without being swaddled in about seven layers of clothing. The stroller contingent is out in full force by 11am, but if you get there early, the experience is pretty serene and the parking is pretty easy. My favorite vendor is Tomatero Farms because they always stock beautiful bunches of kale, radishes, leeks, tender heads of cauliflower, at very reasonable prices. Other highlights include the flower vendor right across from Tomatero Farms’ tent, who sells bunches of freesia for about $4, ranunculus for $5, and mixed bouquets for only $8. 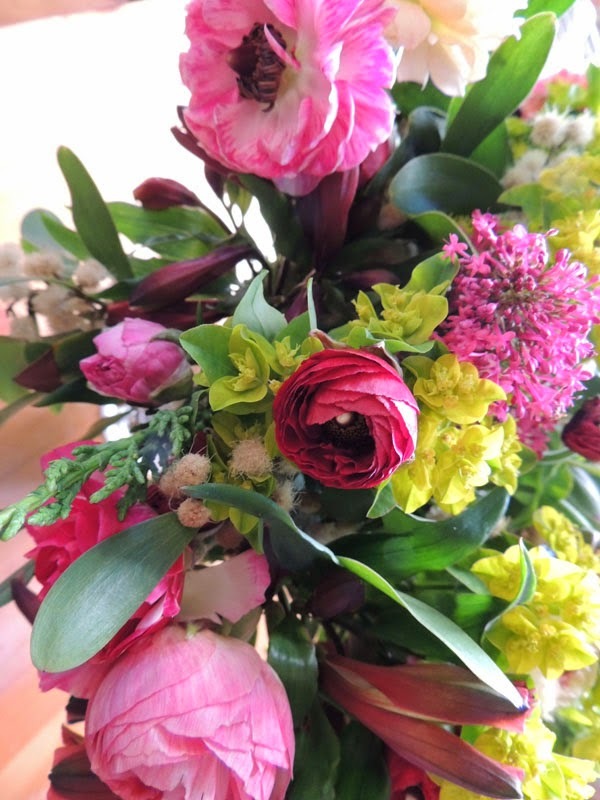 I would go to the farmers market in Marin just to buy flowers, that’s how much I like them! After returning home with a bounty of beautiful produce, I wanted to make something delicious, light, and highlighted the seasonal ingredients. I’d never cooked with dandelion greens before, but I do love bitter greens and pesto so this recipe was just what I needed. It’s also a great transitional soup for when the weather is not quite warm yet – the creaminess of a hearty winter soup without the heaviness of full fat cream. 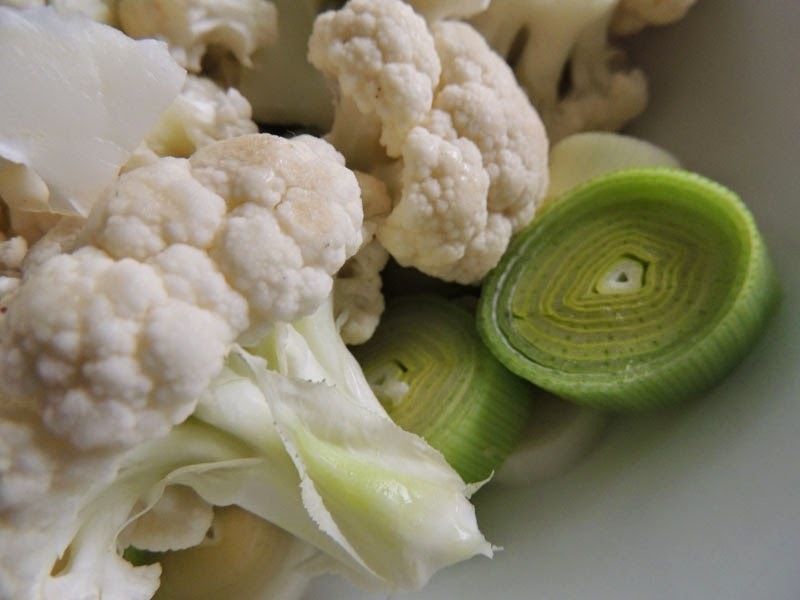 Preheat the oven to 425º F. In a large bowl, toss together the cauliflower, leeks, onion, garlic, 1/2 tsp salt, and olive oil. Pour onto a parchment paper-lined baking sheet and place in oven for 20 minutes or until golden. In a large soup pot or Dutch oven, combine the roasted vegetables, potato, vegetable stock, coconut milk, thyme leaves and remaining salt. Bring to a low boil, reduce heat, cover and simmer for about 10 minutes or until the vegetables are tender. Remove from heat. Using a stick blender or working in batches, puree the vegetables and stock into a smooth consistency. Set aside. To make the pesto, gently toast the walnuts in a dry skillet. Add to a food processor or blender along with the garlic and process until a fine crumble. Add the chopped dandelion greens, Parmesan, and salt and process again until the greens are well chopped, then drizzle in the olive oil as the food processor or blender is running, and let everything process into a paste. Add more olive oil, a tablespoon at a time, if needed to make it the desired consistency. You can also add a bit of water to thin it out. 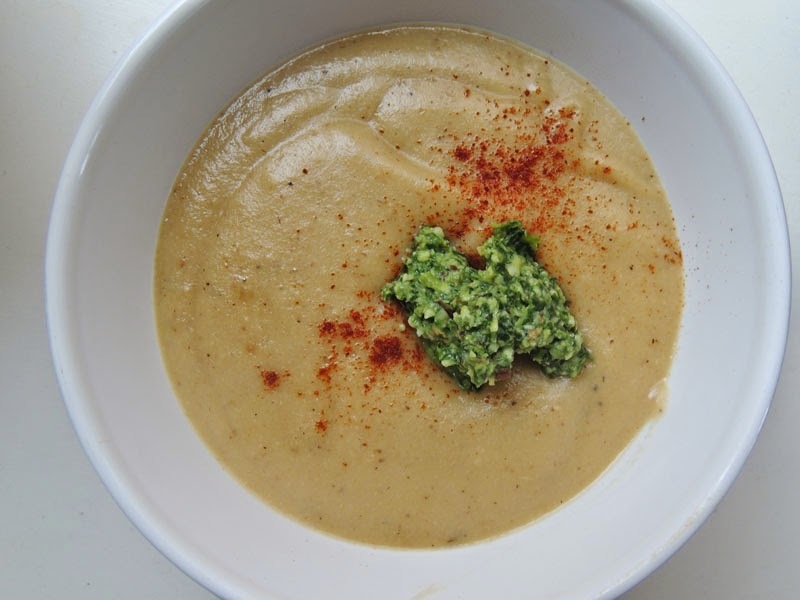 To serve, ladle into soup bowls, top with a dollop of pesto, and a sprinkle of smoked paprika.